Just steps to the Ocean! Both Ocean and Bay View! Located on 126th Street. Unit 4 which is the top left unit. We do not have an elevator. REMODELED MARCH 2016 - New carpet, paint and bedding as well as other cosmetic improvements. Cable TV. TV in living room and all bedrooms. 1 Private parking space with plenty of street parking. Common area deck for small gatherings. Private deck outside front door. For your convenience the unit has central Air Conditioning and heat as well as a full-size washer and dryer, fully stocked kitchen, breakfast bar, and a full-size dining table. Two bedrooms have queen-size beds and one bedroom is equipped with two bunk beds (single top/double bottoms). Great for two families. Linens are not included. CLEAN AND CLUTTER FREE! YOU WILL LOVE IT! 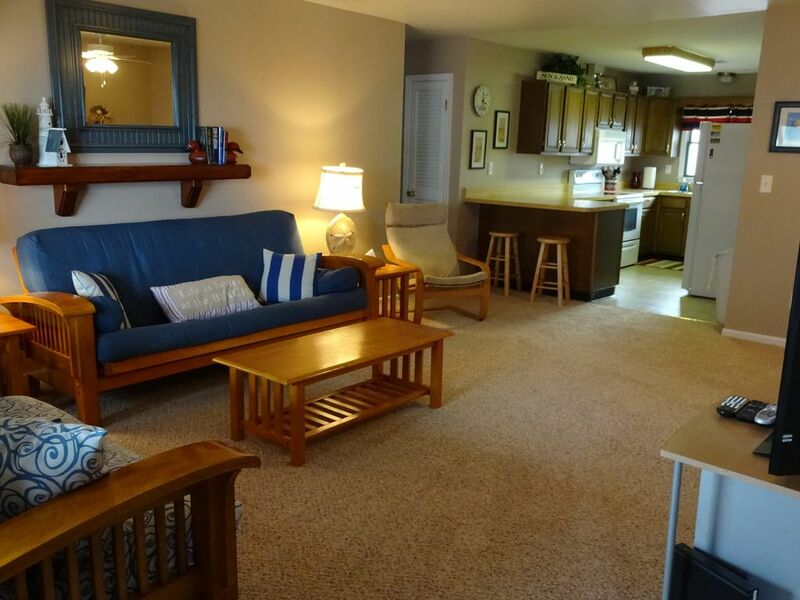 Unit sleeps 10 but no more than 6 adults are allowed during any one rental period. RATES: Quotes are provided based on capabilities of the website. They are subject to change upon inquiry. Things like pet fees, discounts and security deposit vary depending on time of year. HOLIDAY WEEKENDS are subject to increased rates that are not currently reflected. I have personally owned and managed this property since 2000 and take pride in my home and its condition. CLEAN - I receive unbelieveable ratings of how clean and well kept our unit is. You will enter this unit and immediately be happy with your rental choice. References available upon request. minimum staples, don't expect to find everything you need. Rates are subject to change and above quotes are estimates only as rates change depending on the date of your stay. Change over day is typically Sundays - Check out is 10AM and check in is 2PM. Times are negotiable depending on our rental schedule. Pet fee quoted is for the Prime Summer months and less expensive during the off season.